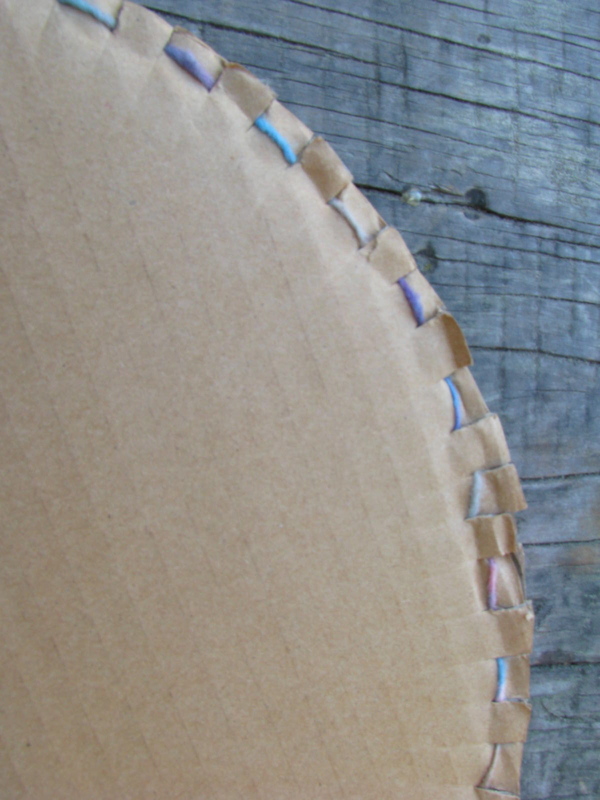 I wanted to post pictures showing more detail about the construction of the circular hats from previous posts. Here they are! The color theme for this hat was blue. My challenging color. I used some of y own hand spun and some commercial novelties. In this picture I want to show with more detail how the warp wraps around the grooves. Sorry for the shaky hand! This is how it should look at the back of the cardboard. 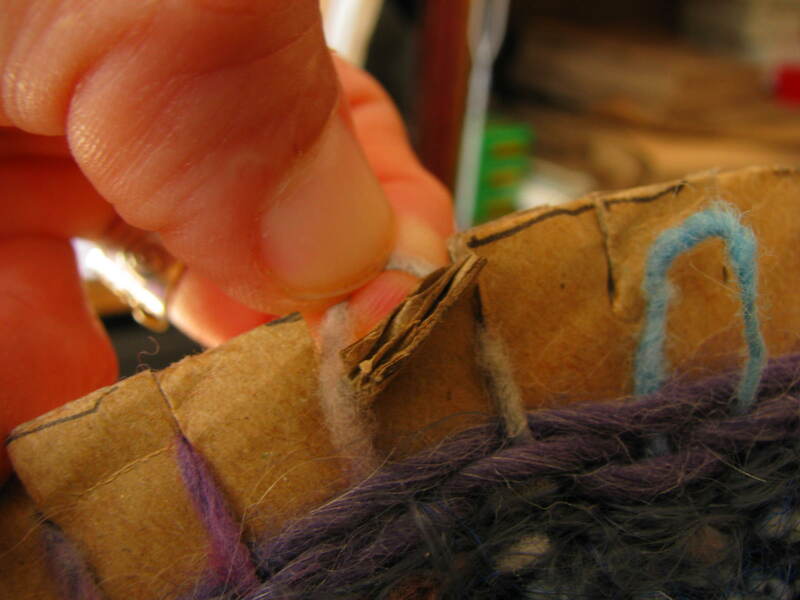 Then, proceed with the weaving process as normal. 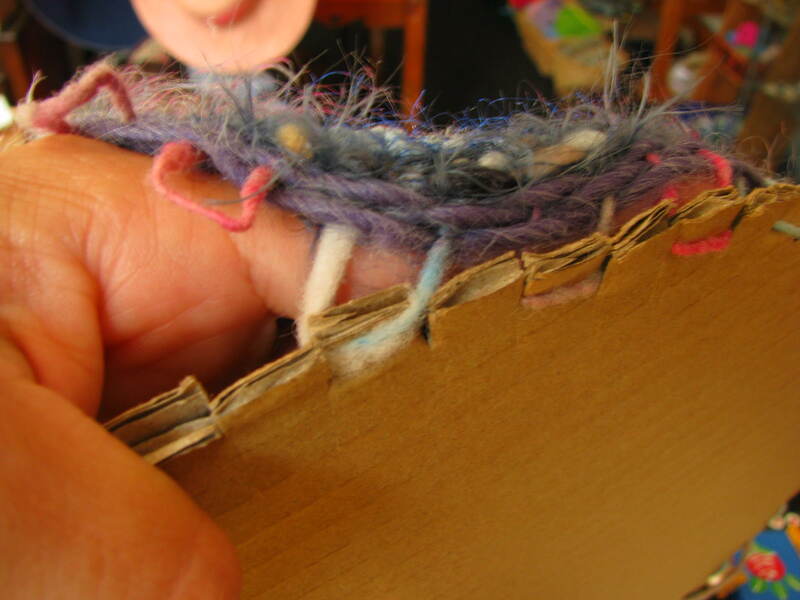 When you are ready to release your piece from the cardboard, just pull each section from the grooves. It should come out easy. These ends hold your circle together. This picture show it with more detail from back to front. You will use this ends to cast on the stitches needed to make the head band for the hat. Now, I haven’t try this, but I will definitely do it next time. I will trow the woven circle in the washing machine for a few minutes to full the piece and see what happens. I’m thinking that it will give the cloth more strength. The last step is to pick up the stitches to crochet (or cast on stitches to knit) the head band for the hat. I hope this make sense. If you try this, please send pictures. I would love to post them here! Happy weaving! 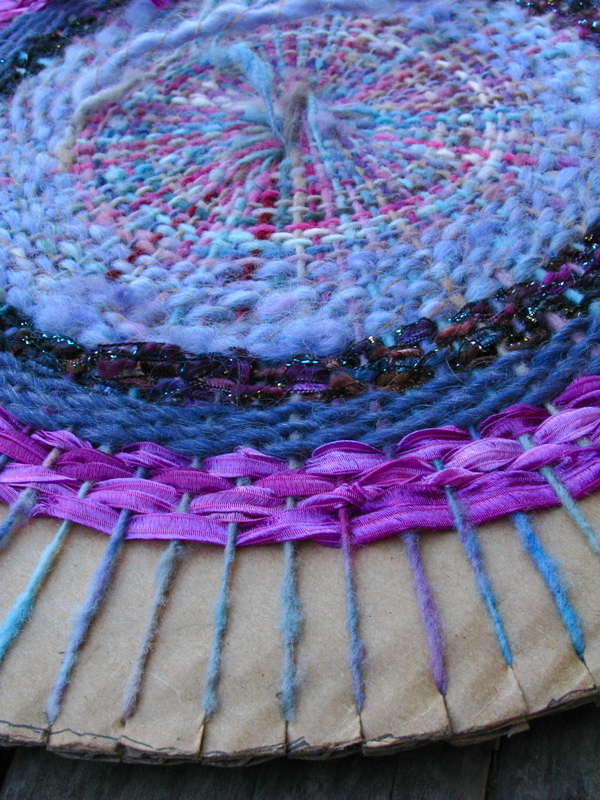 This entry was posted in Fibers, Projects, weaving and tagged circular weaving, hat. Bookmark the permalink. How large is your cardboard circle? The diameter is about 11 inches. Hermoso todo, gracias! Pero. No muestra el final para terminar el sombrero o boina, cómo le damos forma. Por favor enviar instrucciones más completas para terminar la boina. I learned this technique in primary school. Loved it! Took it home to experiment and I don’t know how many dolls, pincushions etc. I made… Never thought of hats! Great idea and they look beautiful. I have just started this, too! 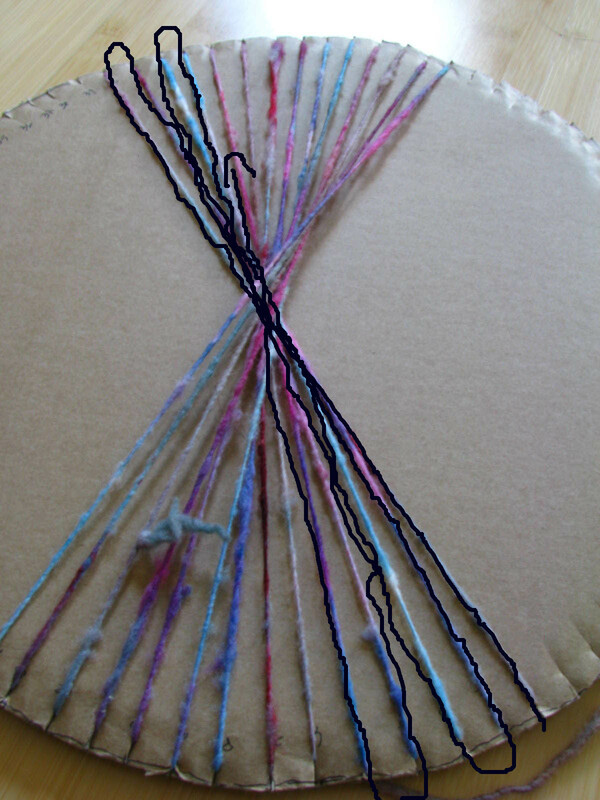 I warped one of those plastic circle looms last night just to try it out, using just regular acrylic 4 ply yarn. Working on it off and on all day I’m almost finished with the first circle. I decided to see if anyone else was doing this and if so, what they were making with their circles, so I did a google search and your site came up. I’m not sure what mine will eventually be, but I like your idea a lot. 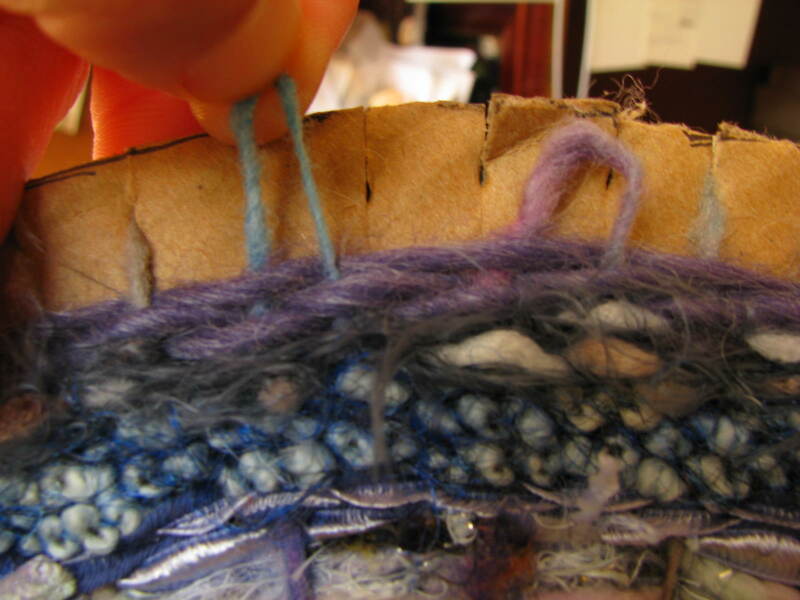 PS – the link to the book (Weaver’s Craft by L. E. Simpson ) – I found that exact book in a used book sale in Scotland while visiting there two years ago. Immediately bought it and have read through it several times. Very informative book and I’m glad I have it on my shelf for future reference. Share your pictures. I’m curious too to see what other people are doing with their circles! ipod touch case cardboard weaving tutorial???? can you make one? We used to use this technique to make a tea cosy when I was a child in England back in the 40s. They were made in a beehive shape and had a slot on each side for the handle and the spout…..meant to keep the tea from getting cold…and they worked….we also make egg cosys for boiled eggs. No central heating in England in those days and things cooled down in a hurry! Would you think making a rug with this technique would be advisable? Gwen, I’ve seen huge circular rug looms at a historical site in Illinois The rugs produced looked very cool. How would you make a “frame” large enough to create a room size rug? I was thinking maybe a “backing” made of duck cloth or heavy muslin, put stitches around the fabric, making a circle large enough for the rug’s dimensions? Or would you just start a regular size one and keep adding somehow? I’ve not done this before, but it’s facinating. I have been thinking about making a rug this way myself. I can get big cardboard. I assume you start in the middle did you tie off in the beginning and tie on the next thread? I am use to using strips of fabric but this is awesome. since not making a headband, would I need to do something to the outside edge to keep it from coming apart. I was thinking a binding maybe anyhow. just curious, what do you think? I crochet a lot of berets and mine need to be 13″ across. So how big across is yours using an 11″ circle once you take it off the cardboard? This is fantastic. I do not need a hsy. 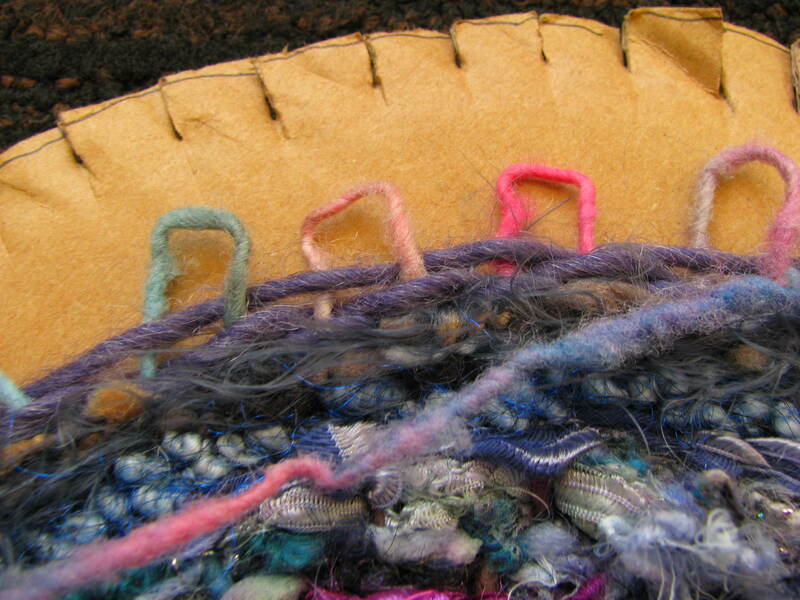 But I love the weaving process to try placemats using different ysrns and ribbons. Wow! I love your tutorial! AND the weaving! Am experimenting with various kinds of weaving for a series in June and I will definitely be linking to this beautiful tutorial! I’ve done lots of cardboard loom weaving but never once considered a circle!!!! This is so cool. Do you have a video of this? How do you determine the amount of slits in the cardboard and how far are they apart? I just eyeball it. About 1 cm apart. What a nice way of putting it! Can’t wait to get started on one of these!! Beautiful! Will the weaving stay flat? Any ideas how to create a circle weaving that does stay flat? I made a bunch of these with different fabric, yarn, ribbon, etc to sew together for a rug. 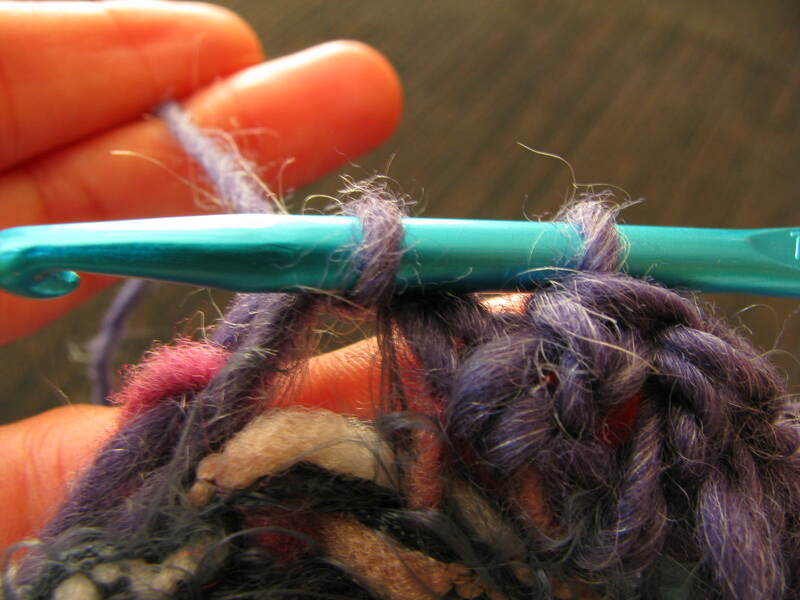 I really struggled with them staying flat – tried weaving tight and weaving loose. Neither worked well for me. I ended up blocking them like you would a knitting project, but they were just sort of flat. I sewed them onto a felt backer, so it was fine for my project. I would love to hear how others got their to stay flat. This is so interesting. I would like to see finished products. I am imagining rugs hats baskets? What do you make with the circles? What type of crochet did you use for the bottom? These are gorgeous! Wondering if you have a even number or odd number of cuts on the circle. Great! How many rows of crochet did you use for the headband? Thanks!